Like most people I have a lot of stress in my life. Exercise is a great relief from that stress but we can’t exercise all the time. Yoga, meditation and even breathing a certain way, usually from your gut, can be relaxing. Another cool way to relax is floating, it helped Daredevil and it can help you. 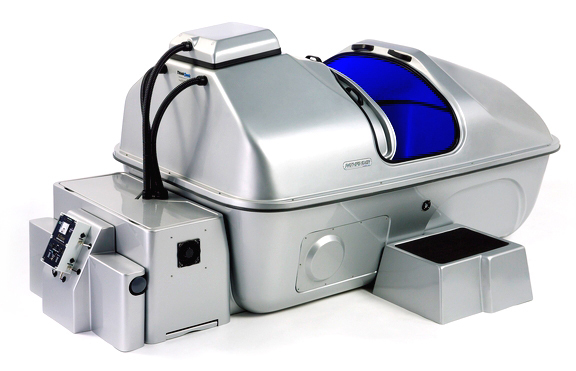 Float tanks, or sensory deprivation chambers, are typically fully enclosed ‘pods’ molded from fiberglass. The idea is to immerse yourself in total tranquility; no light and no sound for 1-3 hours. This site has a list of manufacturers to get you on your way. The tanks themselves usually have a cool Sci-Fi vibe going, like something out of Woody Allen’s ‘Sleeper. A good tank will include a ventilation system, temperature control, ultraviolet lighting for purification and in some cases a sound system (not really denying your sense of hearing, but listening to white noise, a babbling brook or crashing waves can have it’s own positive effect). A good tank will also run you about $10,000. Note: The tanks are filled with water and an enormous amount of Epsom salts. The salts keep you floating (even those of you who typically don’t float well) but can also irritate eyes, open wounds and the recently shaved. Those afraid of enclosed spaces can increase floating times until they are comfortable. Please be sure to consult a physician before floating.